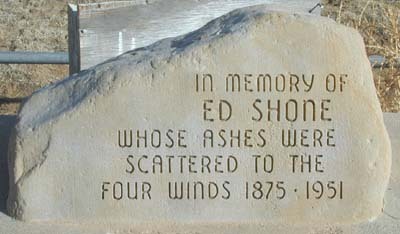 The Shone Memorial is located in southeastern El Paso County. From the eastern edge of Colorado Springs, take Highway 94 east for 24 miles; turn south on Edison Road and go 10 miles; then turn east on Shear Road and go three miles. The marker is on the southwest corner of Shear and Whittemore Roads, fenced off with a pipe barrier from a pasture. According to GPS-derived geolocation (accurate to within 10 meters), the grave's coordinates are latitude 38°41'39.7"N and longitude 104°06'32.0"W.